The Perdiguero de Burgos, or Spanish Pointer, is a large pointer that has contributed to the development of the other large pointing breeds. 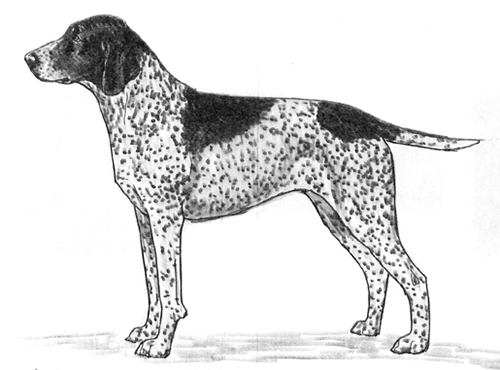 It has been in existence since the 1500’s, and is thought to be descended from the Old Spanish Pointer and a Spanish scenthound. The breed was used as a specialist on deer for most of its history but today it is mainly used on quail, partridge and hare. The Perdiguero de Burgos was recognized by the United Kennel Club January 1, 1996. A hunting dog of good size, with a well developed head, pendulous ears, compact body and solid legs. It is short coated and square in proportion. Calm and sedate, an excellent pointing dog used on fur and feather, with an excellent temperament and noble, soft expression. The head is large and powerful, with a well developed skull, a strong foreface and hanging corkscrew ears. The head is moderately rectangular seen from above, and narrows progressively towards the nose, but does not have a pointed muzzle. The skull is slightly longer than the muzzle and the planes of the skull and muzzle are divergent. Broad, rounded and convex in profile, with a well marked median furrow and a slightly marked occipital crest. The stop is a gentle slope. Straight in profile or slightly convex towards the nose, broad in its entire length. The Perdiguero de Burgos has a complete set of evenly spaced, white teeth meeting in a scissors bite. Disqualifications: Undershot or excessively overshot. Dark brown, wet, large and wide. Disqualifications: Split nose or black nose. Partial or complete lack of pigment of the nose. a soft, sometimes sad expression. Eyelids are fully pigmented, brown in color. Set at eye level, large, hanging and triangular in shape. Without being drawn forward, they must meet the corner of the lips, but not the nose. At rest, the ears hang gracefully in a corkscrew. They are soft and limp with fine skin and hair. Strong, powerful and slightly arched, with a double dewlap that starts from both corners of the lips. The shoulder blade and upper arm are moderately sloping and equal in length. The legs are straight and parallel, with strong bone. The elbows are close to the body. The pasterns are strong and slightly sloping. Square, strong and robust, giving the impression of power and agility. The chest is broad and deep to the elbow, with a prominent sternum. The ribs are well developed and round. The withers are well defined, and the topline is strong and straight, with a slight downward slope towards the croup. The loin is broad and muscular. The croup is broad and sloping. The belly is moderately tucked up. The hindquarters are strong and muscular, with good bone. The angulation of the pelvis and the femur is approximately 100 degrees. The upper thigh is very strong, with clearly defined musculature. The lower thigh is longer than the upper thigh. Angulation at the stifle is approximately 120 degrees. At the hock joint, it is blunter than 130 degrees. Well knuckled up cat feet, with hard pads. Thick at the root, set at medium height, generally docked to one half or one third its length. Dense, short, smooth and evenly distributed all over the body. White and liver, irregularly patched or roaned. Often there is a distinct white patch on the forehead. Disqualifications: Black coat color. Tan markings above the eyes or on the legs. Height at the withers for males is 24.5 to 26.5 inches. For females, it is 23 to 25 inches. Typical gait is a steady, economical trot, flowing and powerful with no tendency to roll or amble. Partial or complete lack of pigment of the nose. Tan markings above the eyes or on the legs.